May [Fleet] warp at preferred range. Mission is flagged completed after you have destroyed the Outpost Headquarters and Zor. A pair on each flank. Kill Zor, destroy the Outpost Headquarters and warp out. Incoming DPS will get intense at close range, make sure your ship is tanked properly or fitted with MJD to jump to sniper range if needed. Zor drops Zbikoki's Hacker Card, which is used to blitz the Worlds Collide L4 mission. Zor occasionally drops Zor's Custom Navigation Hyper-Link - a ~53 mil implant. Zor deals long range damage, so some tank is needed even on sniper fitted ships. The frigates will web and may kill T2 small drones, best to use T1 drones. Kill Zor first to reduce the incoming DPS. If he is out of range, kill the closest Cruisers and hit Zor once he is in optimal. Take out several Cruisers to quickly manage aggro, shoot the Battleships and then the rest of the Cruisers and the Frigates. Start with the Frigates from group 2, then the Cruisers before they get into their optimal range (~15km) and finally the two Battleships. 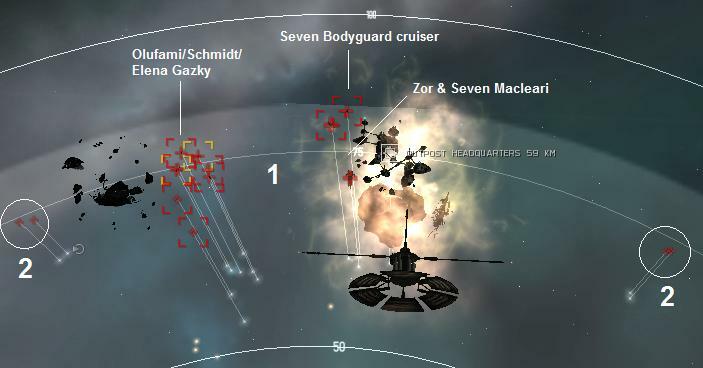 Non ganged logistics ships do not get aggro from group 2. Black Market Facility drops 10 narcotics. Outpost Headquarters drops 5 Metal Scraps.